Windows is not as easy, but pythonxy still helps a lot. Easiest way is to install chaco is to use pythonxy python distribution. You need to make sure that “ETS” and “wxpython” are selected for installation. You can use EPD to run pytimechart on OSX. Please note, that I have issues to make it run on latest version of EPD/pytimechart. Pytimechart is only a trace visualizer, it does not actually make the trace. You have to generate it with other programs. unlike perf and trace-cmd, this script write the data to filesystem at the “stop”. During the workload, trace is kept in memory. I never needed any workload that would need more than 50MB of trace buffer. You can modify the script as you wish, but dont worry about removing some tracepoints. They are really very low overhead, and can be filtered out by pytimechart easily if they are too noisy. Every trace type can make sense at some point. Its better to have it in. No drawing means the cpu is running at that time. identifier of the process is displayed at the left of the line. It contains the “comm” of the process , its pid, and the total time of running. Scroll wheel: Zoom in, Zoom out. Normally, scroll wheel only zooms on the time axis. You can use the Ctrl modifier key to zoom on time axis and on the y axis. By default, pyTimechart will hide the process that are not active in the current zoom window, so that you can concentrate on important processes. PageUp/PageDown: For people using timechart in planes its not always handy to use scrollwheel of the touchpad. ;-) The PageUp/PageDown keys are mapped to zoom up/zoom down. The process list is very important for best use of pyTimechart. Usually, the trace will contain far too much information, The first thing to do is to hide a bunch of process, show only the process or event that highlight your problem, zoom on it, and show again processes that are active around this time. Comm: The ‘comm’ of the process, or if its not a process, its name. stime: The time where the process is active in the current selection. You can sort the table by clicking on column title with CTRL key down, Ctrl-clicking again will restore the original “sorted by types” order. When you select some process in the process list. They will be highlighted in blue in the timechart as well. In order to easily find your processes, a filter as been implemented. to only show process that have minimum activity duration in the process list. to only show process that have minimum activity occurences in the process list. This is useful to look processes that does not stay long but generate lot of wakes. The toolbar tools all have tooltips that user can see with mouseover on the tools. Following is the detailed description of each action. All processes that are not currently visible in the timechart will be hidden This is usefull when you zoom at a particular activity, and you want to unzoom without being noised by other activities. All processes that are currently visible in the timechart will be hidden This is usefull when you zoom at a particular noise activity, and you want to unzoom without being annoyed by this activity. If this option is disabled, and a process does not have any activity in the current view, this will show an empty line, and eat vertical space for not much meaning. This is why it is recommanded to leave this setting on. This make sure all the process that are not hidden fit the window vertically. Disable this feature if you want to manually zoom though the y-axis with the CTRL+mouse wheel command. Wake events are generated by the “sched_wakeup” trace_event. wake events are represented by a row connecting a process to another. Reason of wakes can be for example: * kernel driver waking up process because IO is available. * user thread releasing mutex on which another thread was waiting for. Sometimes, looking at the textual trace is more precise than just looking at the timechart. Moreover, all the informations of the trace is not represented by the timechart. 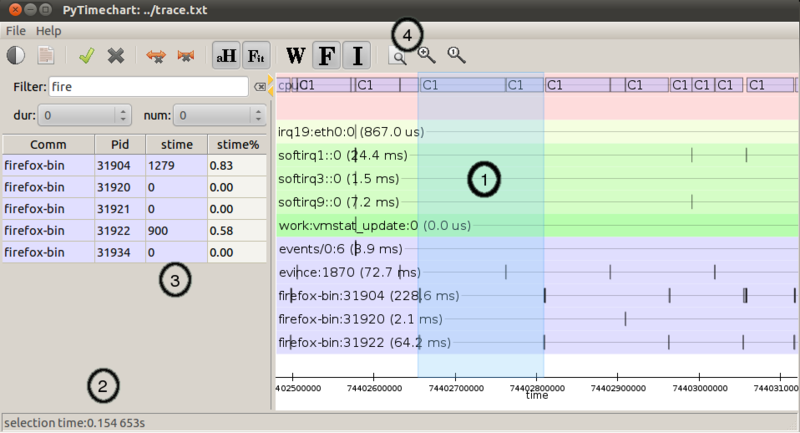 The selection is a very important UI element of pytimechart. 1. You can start selecting part of the chart by click-and-drag with the right mouse button. 2. While selecting, you can see the duration of the selection in the status area, in the bottom of the window. This is very useful to measure the duration of an activity, frequency of a wake, etc. 3. The process list is also automatically updated with activity statistics over the time interval of the selection. 4. You can also use the toolbar action to zoom on the selection, or extract the textual trace delimited by the selection. © Copyright 2011, Pierre Tardy. Created using Sphinx 1.0.1.